The Sewer is a room inside of the Haunted Towers in Luigi's Mansion: Dark Moon. The Sewer can be accessed by taking the north door inside of the Gardener's Dwelling or by taking the coffin lift outside of the Old Graveyard. The Sewer is a narrow area with many arches in the wall. Red plants hang from the ceiling. To the far left, Luigi can yank off a moss covering with mushrooms to reveal an area with two coffins and many candles. In The Pinwheel Gate, it is not mandatory to go to the Sewer unless Luigi wants to capture this mission's Boo. The Boo is found by pulling out the first red plant on the ceiling Luigi comes across. There is also a treasure chest with money that becomes empty after Doggone Key. 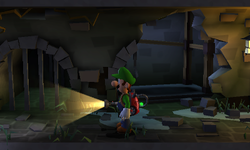 In Graveyard Shift, Luigi needs to use the coffin lift in the Old Graveyard to reach the Sewer after rescuing the trapped Toad assistant and defeating The Three Sisters. If Luigi comes to the Sewer before rescuing Toad, he can play a bonus game by entering the coffin on the far left. This page was last edited on May 25, 2018, at 00:31.